I mean, is there anything more comforting? 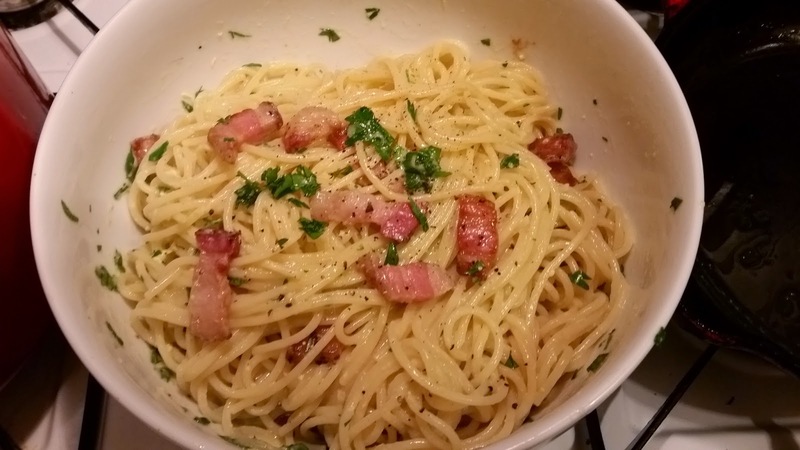 If pasta is the warm blanket of food, Carbonara is the cashmere version. Pasta, eggs, pancetta or bacon, wine, parmesan and romano...all pure, luxe softness. 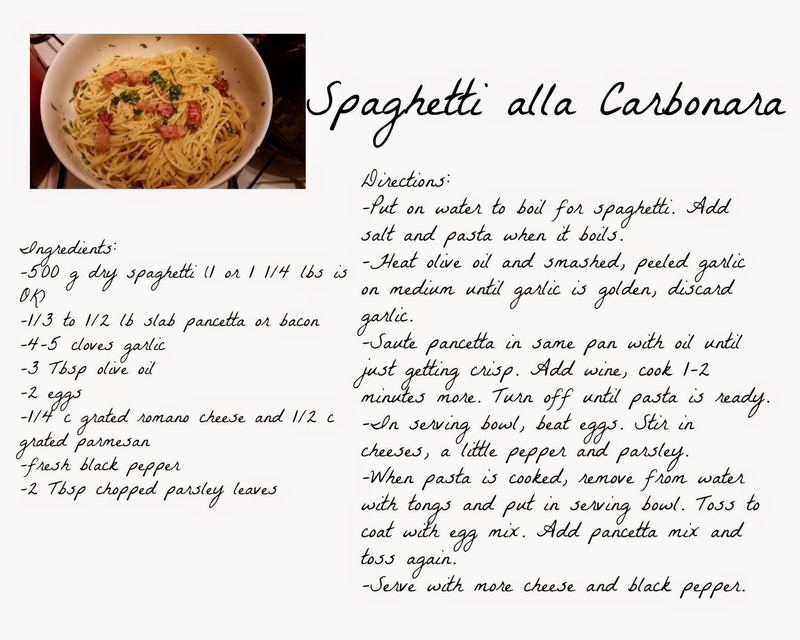 I've added a printable recipe jpg at the bottom for ease! The first recipe I came across was very different from this, a more Northern Italian style with a creamy sauce and ham from a Time-Life international cookbook. This classic Roman style here was another revelation, eggy rather than creamy and even more luxurious. After being led astray a few years ago by a well-intentioned recipe that tried to reduce the fat but left the whole dish very soupy, I referred to my trusty copy of Marcella Hazan's Essentials of Classic Italian Cooking, knowing the amazing Marcella (may she rest in peace) wouldn't let me down. Here is my version, only very slightly altered. * 1 1/4 lbs spaghetti is an odd amount. If you can find a 500 g package from Italy, use that. If you can't and you don't want to open a second package, 1 pound is fine. 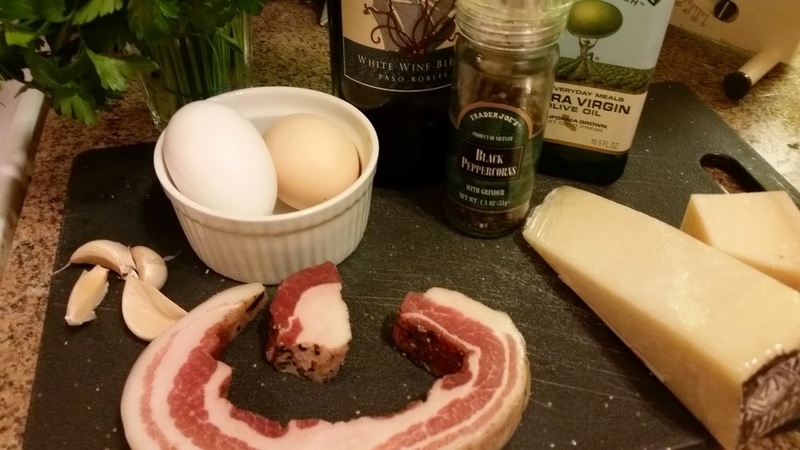 ** Guanciale is reportedly the most traditional cured pork for this, but it can be hard to find and rather $$$. As I'm in the Bay Area I could have found some, but I decided not to run all over town. 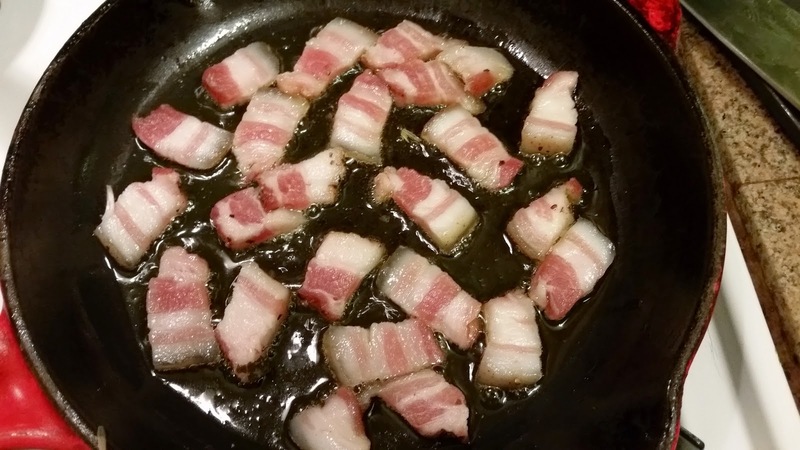 If you can get a nice slab of pancetta from a good meat counter that's also great, or if you can only find packaged stuff, get the thick sliced bacon. 1. Preparation: Put a large pot of water on for the pasta. When it comes to a boil, add 1 to 1 1/2 Tbsp salt to the water and bring back to a boil before adding the pasta. Only a little will be absorbed by the pasta, and it will help the pasta cook better. Don't add oil. While waiting for the pasta to boil, cut the pancetta or bacon into pieces about 1/4 in thick and 1/2 in wide. 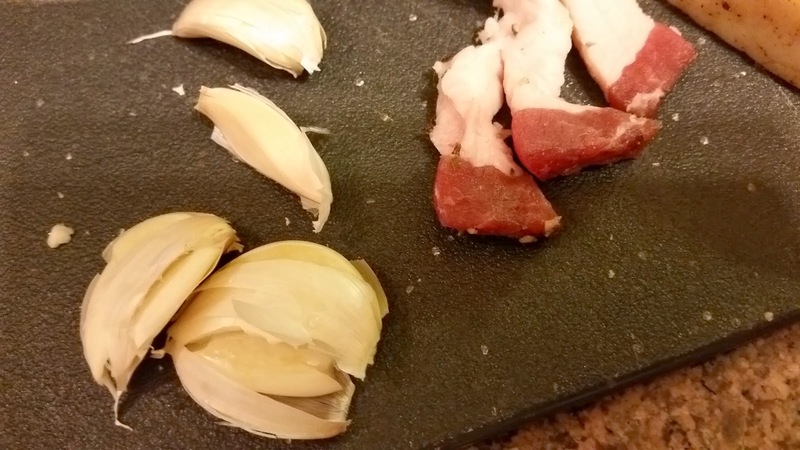 Crush the garlic with the side or the handle of your big knife. Remove the skins, but leave whole. 2. Start the sauce. Cook the olive oil and garlic in a saute pan over medium heat until the garlic is golden. A 10 inch pan is probably ideal, but use what you've got. 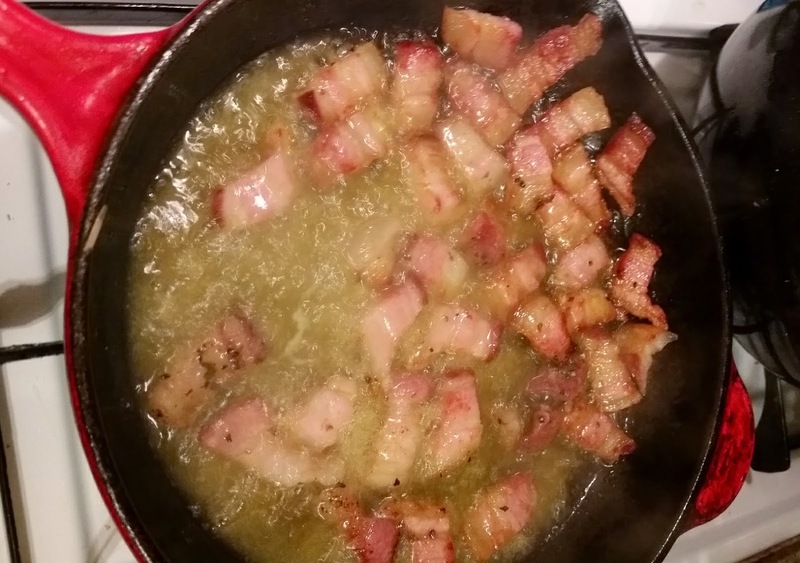 Add the pancetta pieces to the pan and saute, turning over once, until just a little browned on each side. Usually, I'm a crispy bacon girl, but you want a little texture here. Carefully add the white wine to the pan and continue cooking for another minute or two. Turn off the heat until the pasta is ready. If you do want to reduce the fat a bit, remove a couple of tablespoons of fat from the pan before adding the wine. Then after adding the wine, add a couple of tablespoons of the salted water the pasta has been cooking in. 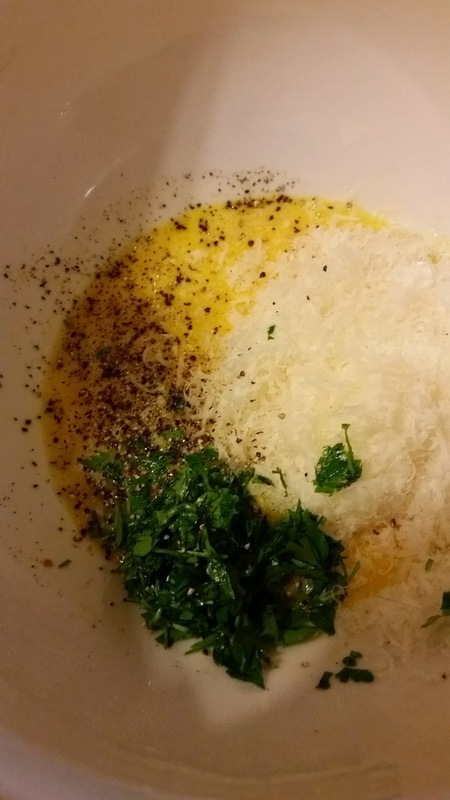 Crack the two eggs into a large bowl (the same bowl you'll be serving the pasta in). Beat the eggs. Add the grated cheeses, a few grindings of black pepper, and the chopped parsley leaves. Stir everything together and set aside until the pasta is finished cooking. Because the heat of the pasta cooks the eggs, you want to make sure to use hot pasta straight from the pot. When the spaghetti is cooked just how you like it, don't drain it in a colander. Instead, use tongs or a really big fork to remove it from the water and put it straight into the bowl. This way, the tiny bit of starchy salty water still on the spaghetti will incorporate into the sauce and make it silky. Pretend that handsome Scott Conant from Chopped is watching. He would scowl if he saw you with a colander. 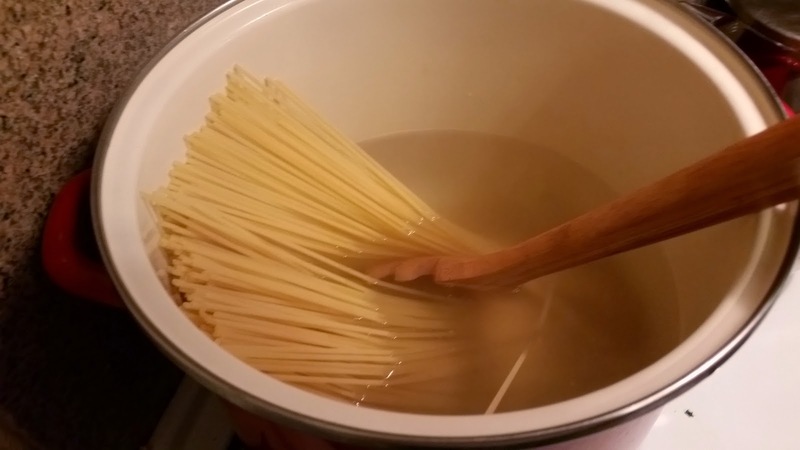 This method of taking the spaghetti from the pot also ensures that you'll have plenty of that water left if the spaghetti is too dry. 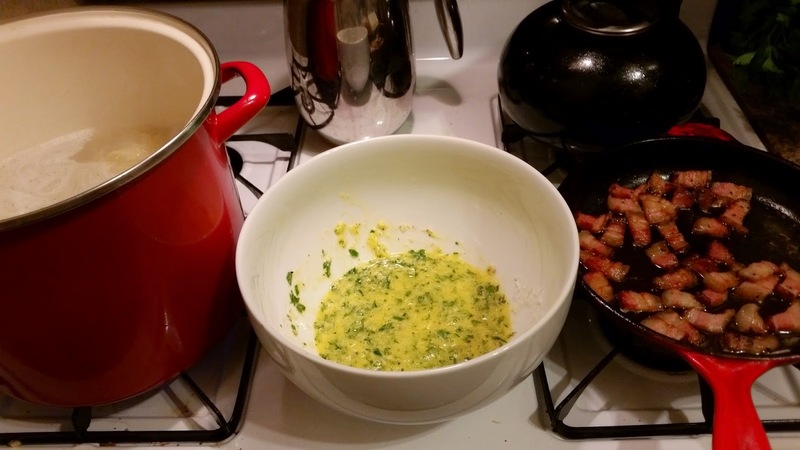 Put the pasta in the bowl and toss well, Then add the contents of the pancetta pan and toss again. Add a little of the pasta water if it seems dry to you. 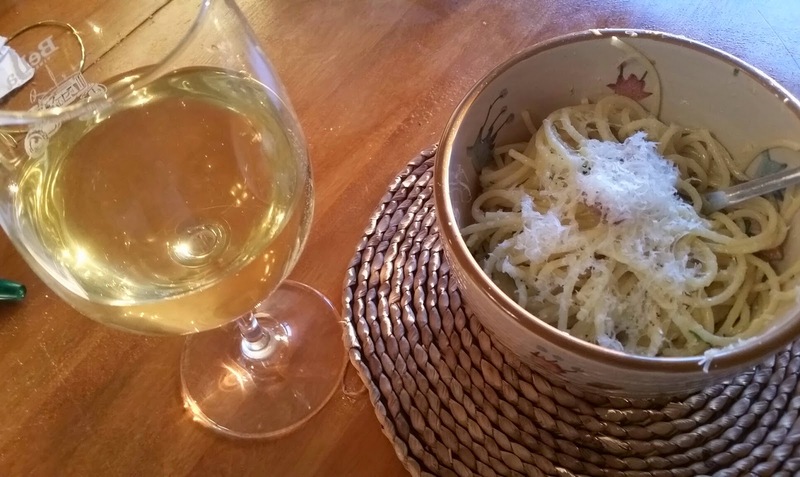 Serve with more grated cheese and fresh pepper...and maybe the rest of the wine! Printable! Right click, save image to your computer and then print.